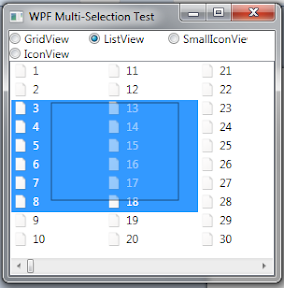 As I am trying to code a WPF File Explorer, Multi-Select List View is very important to me. Two years ago, I developed a MultiSelection Helper which uses HitTest to do the tricks, but as Mickey Mousoff points out, it's an overcomplicated and non-effective approach, I agreed, but that's all I could offer at that moment. The new approach is even more complicated, I rewrite everything except the ListView, but it is worth it as it can provide better performance. VirtualWrapPanel and VirtualStackPanel already have this implemented. The structure of a ListView is shown above, which embedded a ScrollViewer, and a ScrollContentPresenter then ItemPresenter. The ItemPresenter contains the Panel specified in the View, in this case, VirtualWrapPanel, it's the Panel that hosts, measures and arranges the items. Because the ScrollContentPresenter is the topmost control without the scrollbars, I attached most events here, as well as the adorner in the AdornerLayer shown above. It looks very simple, but there are a number of issues that are required to be solved. The reason that some calculation is required (instead of returning the offset directly) is that GridView storeViewportHeight and VerticalOffset differently store ViewportHeight as total number of items and VerticalOffset as the item scrolled to. For GridView, it's easy to deal with because I can just return the items between first and last selected item. 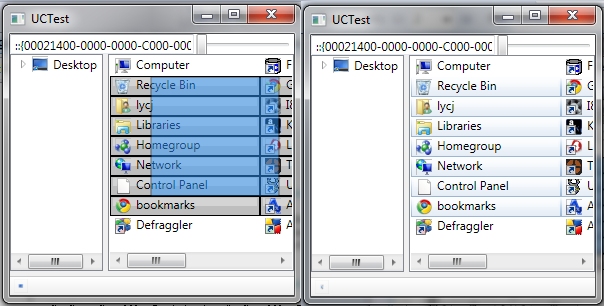 For other views, VirtualWrapPanel and VirtualStackPanel are designed for this purpose, as most listviews use these two panels (all file lists except gridview can be represented by VirtualWrapView), both panels are designed based on Dan Crevier's VirtualizingTilePanel. Because the panels are virtual, the listview items are generated when needed, and thus you must specify the item size. Both panels expose a method named GetChildRect() allowing SelectionHelper to obtain the position of individual ListViewItem. VirutalWrapPanelView is a ViewBase, it allows the coder to set a number of properties of ListView at a time, so to change the list method all it takes is to assign the ListView.View to a new one instead of assigning a dozen properties. VirtualWrapPanelView exposes the ItemWidth, ItemHeight and Orientation properties of its VirtualWrapPanel. Because VirtualPanel is used, not all ListViewItems are generated, thus I cannot signal ListView.SelectedEvent and ListView.UnselectedEvent. Listen to ListView.SelectionChangeEvent instead. SelectionAdorner is designed for this purpose, it is an adorner attached to ScrollContentPresenter (a control inside the ListView which holds the child items). It can display the drag area based on its three properties, IsSelecting (whether the adorner is visible), StartPosition and EndPosition. Fixed click on GridView Header recognize as drag start. For GridView, only support selection if drag occur inside the first column Fixed VirtualListView selection problem by adding IVirtualListView interface. Please noted that this component is replaced by UIEventHub in FileExplorer3. UIEventHub is WPF only currently, and in the latest build it support Multi-Select and Drag-Drop using Touch(and hold). Could you please tell me in which case this error is throwed? I have 2 different physical machines with same sharedFolders but only one of those throwed this exception. Message=Layout measurement override of element 'QuickZip.UserControls.VirtualWrapPanel' should not return PositiveInfinity as its DesiredSize, even if Infinity is passed in as available size. Any idea what I could do wrong? Although your sample doesn't work too well, it did give me some ideas on how to get mine to work better , I think by combining our two approaches, I will get one that works really well. To implement a single new feature, it requires someone to suggest it, then another one to implement it, then another to improve it. Newer implementation should perform better than previous, at least in some area, or it shouldn't be released at all, but lets not ignore the significance of the original version. My MultiSelect component do not support Auto-Scroll, one have to use mousewheel. I would like to have my multi-select to support it, but I didn't advertise this feature. If I remember correctly, when Auto-Scroll is enabled, it will cause trouble when the ListView is using VirtualPanels. I can feel your frustration for spending hours of time to invent something new, then later found a implementation is already available on the net for almost a Year, even worse, it's under LGPL license. Please keep in mind that this is just because I need this feature before you. But nevertheless, if you found my idea useful, please reference my article. Although I am satisfy with the current version, I too want a better MultiSelect, please drop me a message if you need any help to improve your implementation. Yeah, I ran into the same problem (so far) with auto scroll. Its not because of the VirtualizingStackPanel, its because of something else. I analyzed the control code with .NET Reflector and found that there is code in the auto scroll functionality that clears your selected items if the shift / ctrl keys are not pressed. Unfortunately, the mentality in C# development seems to be to make everything private (functions and variables) where as in the C++ days, it was more common to make stuff either public or protected so you could access it in derived classes. Seems like I will have to re-implement that so I can auto scroll without losing selected items. What I mean is... if top item is 0 and VerticalOffset is 0, then item 0 is at 0,0 to width, 17 or whatever. If top item moves to 1, item 1 is now reported at 0,0 to width,17 and item 0 is reported as 0,-17,width,0. This causes an issue with the selection because that needs to operate as if its one continuous page. Maybe you know of a way to get item rects as if it was one really long page? without looping through every item of course . Version 1 uses VisualTreeHelper.HitTest(), which is slow (depends how many items in it), and most importantly, it does not work with VirtualPanels, the items not created simply cannot be hittested, but the advantage of this version is that, it works in all panel types. Then version 2 overcome this issue. As most developer uses only GridView, StackPanel or WrapPanel for their ListView, so I created a fixed size VirtualStackPanel and VirtualWrapPanel, which exposed a method named GetChildRect(itemIdx). Because items does not needed to be created to be "selected", it's much faster than previous version. For GridView, all I needed to know is the first item selected and the last one. Aassuming all item are in same height also works if you are working with the same View only. The second issue mentioned by you is the scrolling issues, my approach is to lookup the ScrollContentPresenter, and retrieve it's position. I think you confused with version 1 and version 2. Both issues are solved in version 2. It is my understanding that using the stock VirtualizingStackPanel, that items that are on screen are always created. Items that have never been shown are not. I'm not sure on the behavior if a visible item goes off-screen, if its container gets destroyed or not. I don't think it does. I think its just lazy creation. Once the item is shown, it stays created (unless you refresh the view). It is not possible to select items off screen . With auto-scroll, the item gets scrolled on screen and gets created. Maybe I have confused your v1 and v2. I will take a closer look at v2 again. I have a requirement for the auto scrolling to work, otherwise, it doesn't seem very useful to me and I'd just tell people to hold down the shift key . You are correct about creation of items of the VirtualizingStackPanel. However, the container do get destroyed/reused when no longer visible, please see the Dan Crevier's article for more information. else if (mousePos.Y > lv.ActualHeight) //isInfo.ViewportHeight is bugged. This component could use some refactoring, I may do it in future. Works a lot better then your v1 (that one didn't work at all)... still, this one doesn't really work well either I know how tricky it is to do this since I'm trying to accomplish the same thing. First of all i must say this is the excelent example for me! But your demo app has a little bug with GridView presentating. Use GridViewRowPresenter instead ContentPresenter when GridView was selected. May also be of interest to you.